Great Gatsby inspired wedding at Greystone Mansion & Gardens, The Doheny Estate, in Beverly Hills, California. 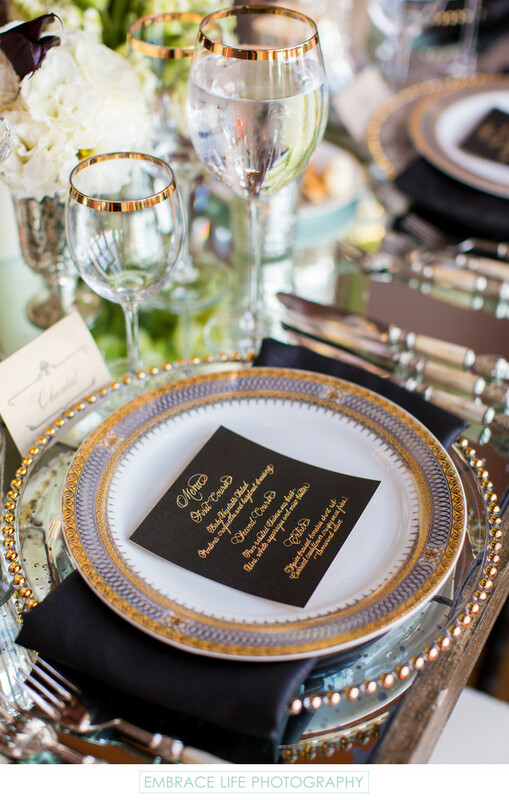 This photograph captures the immense detail that Simply Natural Events tastefully brought together when designing the wedding reception decor, such as these glass chargers with gold beading, intricate gold china, black napkins, gold-rimmed champagne and water glasses, black dinner menus with gold calligraphy, silver vases with white flower arrangements and stylish flatware on a mirrored head table. Keywords: Details (1125), Reception (396), Stationery (78), Wedding (1437).